Thankfulness for the Heavenly Father’s limitless love and mercy aids in the growth in grace and develop “the fruits” of God’s character — “(22) love, joy, peace, patience, kindness, goodness, faithfulness, (23) gentleness, self-control; against such things there is no law” (Galatians 5:22-23). Faithfulness — is Love on the battlefield of life. Meekness — is Love in resignation. Temperance — is Love in training. “Since as Christians we have learned that it is our privilege to be always rejoicing — to rejoice evermore and in everything give thanks — we need not, like the world, wait for special manifestations of Divine favor to call forth our praise, our homage of heart and our grateful obedience to the Lord. Rather, learning that Divine providence is in all of our affairs, ready to shape them for our good, we may rejoice ‘whatever lot we see, since ’tis God’s hand that leadeth us.’ Someone has well said: ‘If we are not ready to praise God where we are, and with our conditions and circumstances as they are, we should not be likely to praise Him if we were differently circumstanced and our conditions just that which now seems to us most desirable. Daniel could sleep better in the den of lions than Darius in the royal palace; he who could not find rest in a lion’s den, when that was the place for him, could not gain rest by a mere removal to a palace’ ” (“From Philippi To Athens,” The Herald of Christ’s Kingdom, Aug. 1921). It is our own self which must be changed, not our circumstances or our possessions, in order to for us to have a heart that overflows with joy and praise. How do you change self? “(13) Brethren, I count not myself to have apprehended: but this one thing I do, forgetting those things which are behind, and reaching forth unto those things which are before, (14) I press toward the mark for the prize of the high calling of God in Christ Jesus” (Philippians 3:13,14). “But I keep under my body, and bring it into subjection: lest that by any means, when I have preached to others, I myself should be a castaway” (1 Corinthians 9:27). “Strengthened with all might, according to his glorious power, unto all patience and longsuffering with joyfulness;” (Colossians 1:11). For a start, we have an eternal gratefulness for being blessed with the richest favors of divine grace in that knowledge of Divine Truth which reveals to us the high privilege of becoming sons and heirs of God, and joint-heirs with Jesus Christ to an inheritance incorruptible, undefiled and that does not fade away, and which is reserved in heaven for the called and chosen and faithful according to God’s purpose. God’s favour toward us revealed to us the hope of everlasting life, as justified, human sons of God and, we understand we have access to full restitution to the divine favor and likeness, as was at first possessed by our father Adam. And how great was our joy when first, by faith, we claimed this precious promise for ourselves and realized that legally, through merit of the precious blood of Christ shed for our redemption, we had passed from death unto life, and that in God’s appointed time the everlasting treasure with all its attendant glory and blessing would actually be ours! But! Beyond even this, are the “exceeding great and precious promises” to those of this justified class who have been called, according to God’s purpose, to become the bride and joint-heir of his dear Son! What a grand aspiration to attain to, that is still available to all who seek to know and please our Divine Father in every single aspect of their existence — who are seeking to fill up their void of loneliness and pain and despair with that peace of God which surpasses all understanding found from finding the best vocation in the world — offering their lives as living sacrifice unto God, and walking as Christ did, being trained to become empathetic priests of God to uplift mankind during the Millennium! To be the “spot lights” which magnify and illuminate God’s love, justice, wisdom and power is truly even now, the most joyful moments of this carnality! What a perfect goal to aim for! Then, in addition to all these blessings of hope and promise, we had the blessed realization during all the year, and with some of us for many years past, that though we walk through the valley of the shadow of death, as the Psalmist aptly represents the present life, our blessed Shepherd’s rod and staff have been our comfort and our safeguard. “You prepare a table before me in the presence of my enemies” (Psalm 23:5). 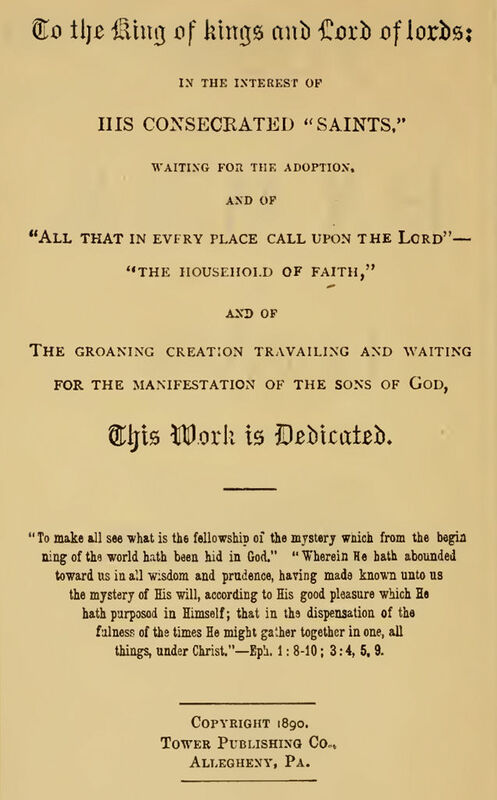 Spiritually, we have feasted on the bounties of divine favor; while in things temporal, under whatsoever circumstances we have been placed, having the assurance that all things work together for good to them that love God, we have realized that Godliness with contentment is great gain, having promise of the life that now is (so long as God wills us to remain here), and also of that which is to come. Let us give Jehovah not only the praise of our lips, but also the incense of truly consecrated lives, throughout the year upon which we are just entering. With the start of this New Year, let us consecrate ourselves anew to the Lord in the sense of re-affirming and emphasizing that covenant. Tell our dear Lord that it is still our purpose to keep our ALL upon the Altar of Sacrifice during 2018 and until it is wholly consumed in His service. Then, let us proceed with studious care from day to day to pay these, our vows of Full Consecration, unto the Most High. As we look back and with sorrow view the imperfections of even our best efforts, and then forward and see the lion-like difficulties that seem to obstruct our onward course, we will need greatly to reinforce our waning Courage with the special promises of Divine Grace to help in every time of need. We have the blessed assurance that “the Lord will give strength unto his people” (Psalm 29:11). “And call upon me in the day of trouble; I will deliver you, and you shall glorify me” (Psalm 50:15). As soldiers under our great Captain, we have enlisted in no uncertain struggle, except our own faint-heartedness or unfaithfulness should make it so. We are fully supplied with the whole armor of God, and will be amply protected against all the fiery darts of the adversary if we accept it and carefully buckle it on; we are forewarned of all the snares and dangers that beset our onward way, so that we may avoid and overcome them; we are fully informed as to the policy and course of the Captain under whose banner we have enlisted, and of the part we are to take under his leading. If we are weak and incline to faint-heartedness we have only to remember the blessed promise, “The Lord will give strength unto his people;” and by our faithfulness in the service we shall glorify God and he will deliver us gloriously from all our foes, both seen and unseen. How To Pay Our Vows? When we consecrated ourselves fully to the Lord, we made a promise to God that we would hold nothing back for self. ALL our possessions, our time, our physical energies and our mental attainments; the sacrifice of ALL our former earthly ambitions, hopes and aims, so that we should no longer pursue them to any extent. This, and nothing less, is what our vow of Full Consecration signifies. It also signifies, further, that these possessions or personal qualifications, which the Lord terms talents, are not only to be released from the service of the worldly ambitions, etc., but that they are to be so released, not for aimless inactivity, but for the purpose of being utilized in an opposite direction—in the service of God, of his plan and of his children. Here are some Bible verses that teach us something important about thankfulness. His Steadfast Love Endures Forever. A Psalm for giving thanks. (1) Make a joyful noise to the Lord, all the earth! (2) Serve the Lord with gladness! Come into his presence with singing! (3) Know that the Lord, he is God! It is he who made us, and we are his; we are his people, and the sheep of his pasture. (4) Enter his gates with thanksgiving, and his courts with praise! Give thanks to him; bless his name! (5) For the Lord is good; his steadfast love endures forever, and his faithfulness to all generations. “Thanksgiving For Spiritual Blessings” by Br. Jerry Moore in The Herald of Christ’s Kingdom. (Song of Solomon 6:3, KJV). The sweetest flower of all God’s family. He was fixed to a cross, to free you and me! White and clean as Christ, thus so endearing. Christ’s lily, growing bright, in whatever our place. Daily, devotedly, even if tired. Refrain from the wrong and walk in Christ’s light. As Christ’s holy name, we ever proclaim! Our crown not to lose, but to overcome! And then, finally, the rest surely will come. Sealed thine everlasting, this is our plea! To be a lily of Christ, let us each strive to be: simple and sincere in humility (Philippians 2:3); sweet and fragrant in gentleness, compassion, mercy, and long-suffering towards all; and joyful in hope (Romans 12:12), enduring patiently (1 Peter 2:20, 2 Timothy 2:24) with contentment (1 Timothy 6:6). May we be at peace, in the valley that God has planted us in to be watered by His steams of living water, found in the Word of God, delivered to the saints by God’s grace and mercy in order for God to be glorified, honored, and praised BY ALL in due time (1 Timothy 2:6, 1 Peter 4:11). The following words are from the Reprints (R4783) of The Original Watch Tower and Herald of Christ’s Presence (which can be freely accessed from the Harvest Truth Data Base website at the following link and under the subheading “ZWT” (Zion’s Watch Tower): http://www.htdb.one/). RIGHTLY understood we find the Bible to be a love story of surpassing interest. No earthly love story will compare with it. First, we have the Father’s love for our race, which, originally created in his likeness, fell by disobedience under just condemnation. What a wonderful story of parental Love blended with Divine Justice is conveyed to us in the narrative of how God so loved the world while we were yet sinners, that he gave his Only Begotten Son to be our Redeemer, that he might restore again to Divine favor and blessing whosoever wills to return after learning of his loving provision. How different this view of the Divine character and Plan from the one which once terrorized us—when we thought of God as almighty in power and knowledge, but destitute of love and sympathy; when we thought of him according to the universally accepted false teachings as having, with cold indifference, sat in the councils of eternity, before the creation of the earth or our race, and there planned our creation and everlasting destiny; that he there deliberately arranged (“according to the council of his own will,” as the catechism expresses it) that he would place us as a race under such unfavorable conditions that only a mere handful, comparatively, would ever attain to a life of bliss, either in the present world or in that which is to come. Deciding also that the vast majority, ignorant (whom the God of this world hath blinded), steeped in inherited sin and degradation, born in sin and shapen in iniquity, should, nevertheless, be so constituted and preserved that they could never end their miserable existences; and, withal, providing, we were told, a great place for their eternal torture, from which would ascend for ever and ever, alike futile and unheeded, their prayers, their curses and their groans. What a relief do we experience as finally we awake to a better knowledge of God and of his precious Word, to find that all these teachings of the Dark Ages were but a horrible nightmare, as unreal as they were cruel and unjust—as unscriptural as they are contrary to every reasonable conception of every reasonable mind, of the proper exercise of Justice, Wisdom, Love and Power—the Divine attributes. We are reminded of the nursery tales of childhood, told to children by parents and nurses who, with grossly mistaken ideas of wisdom and propriety, used them as a lash of terror with which to secure a frightened obedience. As the bugaboos of infancy faded from memory, or at least ceased to inspire terror, as we grew older and began to take note of the deceptions which had been practiced; so as children of a larger growth we have learned that many of the “terrors of the Lord”—which, however severe, are reasonable and just—have been distorted by theologians and others who would fain exercise a terrorizing influence upon the world, to restrain from evil. We have learned, in the language of Scripture, that “their fear toward me is taught by the precepts of men,” and not by any of the Divine precepts—Isaiah 29:13. Oh, what a relief it has brought to our hearts to know God as really and truly a God of love, who is not only willing to save unto the uttermost, but able to save unto the uttermost all who put their trust in him! and who is so willing thus to save that he has made abundant [R4783] provision that every member of Adam’s race must come to a clear knowledge of his grace and to a full opportunity—by obedience to the extent of his ability—to attain eternal life through Christ Jesus. It does us good at times to look back and view, not only the horrible pit and miry clay of sin out of which Jehovah lifted us when he placed our feet upon the Rock, Christ Jesus, but also to remember his mercy toward us in the anointing of our eyes, now in the end of the Age, that we may see wonderful things in his Word; that we may realize how he has graciously brought us “out of darkness into his marvelous light,” in permitting us to brush away the veil of superstition, misunderstanding and mistranslation which has befogged his Word, beclouded our understanding and bedimmed our view and appreciation of the great Father of lights, from whom cometh every good and every perfect gift—James 1:17. Of all the plots and peculiarities of love stories which have been conjured up by human brains, none will compare with this story of how Christ loved the Church and gave himself for her—redeeming her with his own life; and how, being rewarded with excellent glory by the Father, these who would be his companions, are invited to share his cross, his suffering, his death, and to be received up into glory with him, to share his love and his throne and the Father’s favor. We will not go into details here; we have done this before and our readers are familiar with every feature—so, instead, we pass on to consider some of the conditions of acceptance with the Bridegroom, and how we may make our calling and our election sure to this position of honor and blessing to which he has invited us. Our text briefly, yet very pointedly, states the entire matter. (2) It is implied that the one who can say, “I am my Beloved’s,” has not only heard of Christ but has made a definite, positive compact or contract with him. And this contract—to be his in every thought and word and deed, to the extent of our ability, if he will accept us and be our Bridegroom, is our marriage vow or covenant. The Scriptures assure us that in the present time, while evil prevails and the God of this world blinds the minds of the vast majority, none can come to the Lord Jesus, except as the Father draws them (John 6:44). The Father is not drawing all mankind now, but only believers. He is leaving the general work of drawing the worldly for the next Age, the Messianic Age, when Christ and the Church glorified shall, as God’s agents, cause the whole earth to be filled with the knowledge of the Truth. Whenever the Truth reaches the heart and understanding its influence is to draw, although the drawing may be resisted not only in the present Age, but also in the Age to come (Acts 3:23). But, it is only the few who are being drawn to Christ by a knowledge of the Truth now, because only a few have a knowledge of the Truth. And while many resist the truth and refuse the opportunity of union with the great Bridegroom, some have gladly accepted and given themselves wholly to the Lord, thus sealing the covenant binding themselves to him and by his grace binding him to them. It is proper that each one should decide for himself positively, whether or not he has ever accepted the Divine invitation to give himself (Proverbs 23:26; Romans 12:1) [R4784] to the Lord, to be ultimately accepted as a member of his Bride if he continue faithful to his engagement to the end. If we are faithful, and so long as we continue to be faithful, it is our privilege to look up with confidence and be assured of the second part of our text, “My Beloved is mine.” And if we will, it is possible for us to continue in this attitude, “faithful unto death”; and so doing we may know that in the resurrection we shall be with our Lord, and be like him, and share his glory and his throne—Revelation 3:21. How much is implied in this statement, “My Beloved is mine”! We are reminded of the Scripture which declares, “He that hath the Son hath life”—eternal life. More than this, the Apostle assures us that those who have Christ, who can truly, Scripturally say, “My Beloved is mine,” are really possessors of “all things.” For since Christ is the heir of all things, if we have become associates with him, then, indeed, “all things are yours (things present and things to come) for ye are Christ’s, and Christ is God’s” (1 Corinthians 3:22,23). If it lifted from us a great load to know that our sins were graciously forgiven through the merit of the precious blood, how much more of a load of care does it lift from us to know that we are vitally united with the illustrious Son of the great King of the Universe—the Son in whom the Father is well pleased and whom he has made his sole associate in the glory and dominion of the Universe. Nor does this promise of blessings in Christ apply merely to the future. The glories and honors truly are not now, but by and by to be revealed; but the Bridegroom’s care, protection, provision and comfort belong to his betrothed even now, while we are in this tabernacle; so that while we are passing through the “valley of the shadow of death,” we need fear no evil, for he is with us, and his rod and staff comfort us. All who abide faithful to him, all who truthfully can say, “I am my Beloved’s, and my Beloved is mine,” have not only the promise of the life that is to come, but also [R4784] the promise of this present life. They hear the Master’s voice saying, “Lo, I am with you always, even unto the end of the Age,” and in the end of the Age he is to be specially near, specially precious, and is to reveal himself to his faithful in an especial manner, even before she is so changed as to behold him in his glory. It is the privilege of these to apply to themselves, and to realize as properly theirs, all the “exceeding, great and precious promises” of the Divine Word. These may hear the voice of the Lord, saying, I will be with thee in six troubles and in the seventh I will not forsake thee. “My grace is sufficient for thee.” “Call upon me in the day of trouble and I will deliver thee.” Indeed, we are assured and “know that all things shall work together for good to them that love God, to the called ones according to his purpose [to be the Bride, the Lamb’s Wife]“—Job 5:19; 2 Corinthians 12:9; Psalm 50:15; Romans 8:28. What a blessing of peace, quietness of spirit, ability to endure hardness as a good soldier of Christ, and sustenance and strength in time of trial, lies behind these precious assurances of the Bridegroom to those who can see and realize unquestionably, “I am my Beloved’s, and my Beloved is mine,” no tongue can express. It has in the past permitted his faithful ones to pass through many dark and trying experiences with a fortitude that has surprised the world, which has seen them in the fiery furnace, but has not seen that there is with them the form of the Son of God (Daniel 3:25). They have endured as seeing him who is invisible (Hebrews 11:27). The poor world who know not this invisible Friend above all others, and are unacquainted with this Heavenly Bridegroom, and know not his sustaining grace in every hour of trial are, indeed, to be greatly pitied. They must largely bear alone those burdens which the Lord’s people, his betrothed, are privileged to lay at the feet of the great Burden Bearer, whose invitation is, “Come unto me, all ye that labor and are heavy laden, and I will give you rest” (Matthew 11:28-29). But, if the case of the world is a sad one, because it knows not our Bridegroom, how much worse is the case of those who having once known him, and having once experienced his tender care and helpfulness in all of life’s affairs as a Counselor and Guide, have wandered off, having lost their first love; having forgotten that they were purged from their old sins, and become deaf to the “exceeding great and precious promises” pertaining to the present as well as to the future life; and are now striving merely for the things which perish, and which at most are but for a moment (2 Corinthians 4:17,18). These are in a much worse condition than the world. As the Apostle declares, “It had been better for them not to have known the way of righteousness, than, after they have known it, to turn from the holy commandment”—2 Peter 2:21. Let us who have named the name of Christ, who have assumed his name, abide in him—by continuing in faith, in love and in zeal, to walk in his footsteps and thus make our calling and our election sure. “I Am My Beloved’s, and My Beloved Is Mine.” The Dawn Magazine, Sept. 1989, in the Christian Life and Doctrine section. “SONG OF SOLOMON 2:1, 2, 16; 4:5 – The Rose of Sharon & the Lily of the Valleys.” BIBLE Students DAILY.